The Ghanaian currency, the Cedi, has faced a few issues over the past years. As a matter of fact, over the last 5 years, it has lost over 50% of its value against the US dollar. 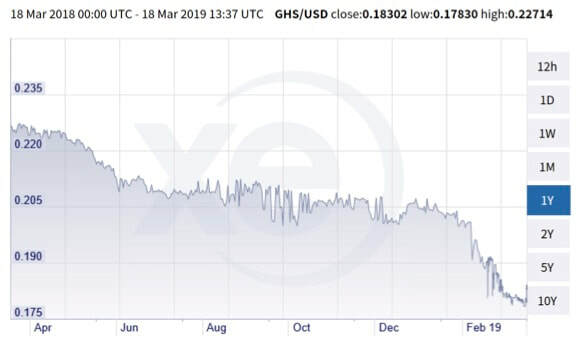 Recently, the unexpected move of the Central Bank of Ghana to cut rates by 100 bps, produced a depreciation spyral for the cedi, that lost a further 9.8 percent of its value from the 28 of January, when the rate cut was enacted. The current exchange rate is 0.18 cedis per dollar, an all time low for the Ghanaian currency. The first to be held liable, as the timing confirms, is the Bank of Ghana. The decision to cut rates worried foreign investors: “Investors might be worried about anti-inflation commitment, similar to Argentina”, says Charles Robertson, chief economist at Renaissance Capital. The movements in the value of the Ghanaian currency are indeed mainly in the hands of foreign investors, who hold 30.6 percent of Ghanaian local currency bonds. 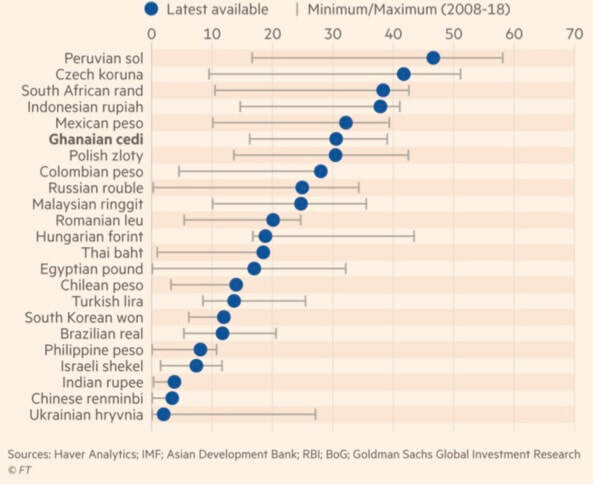 Figure 3 shows that those from this country are among the government bonds with the highest degree of foreign ownership. However, the move of the Central Bank of Ghana does not seem unreasonable in the light of the specific macroeconomic factors of the Ghanaian economy: inflation dropped from 19 percent to a six-year low of 9 percent, which falls within the BoG’s target of 8 percent +/- 2 percentage points. Currently, observers acknowledge, there are no clear indicators that the rate cut will determine a substantial reversion in the deflationary path and lead inflation out of control. From this viewpoint, investors’ concerns about the inflation issue do not seem to be fundamentally justified. 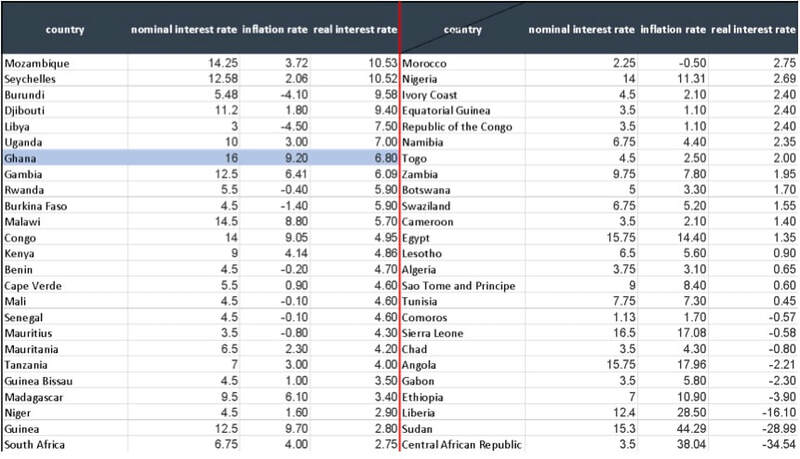 Moreover, the current nominal rate of 16 percent, once adjusted for the current level of inflation, yields a real interest rate of around 7 percent. The latter is among the highest for the African economies, and for countries that in the rank below are either much smaller economies in terms of GDP or countries with a high level of political instability (see Figure 3). Other than the negative market sentiment triggered by the rate cut, there are possible explanations for the drop in the currency. 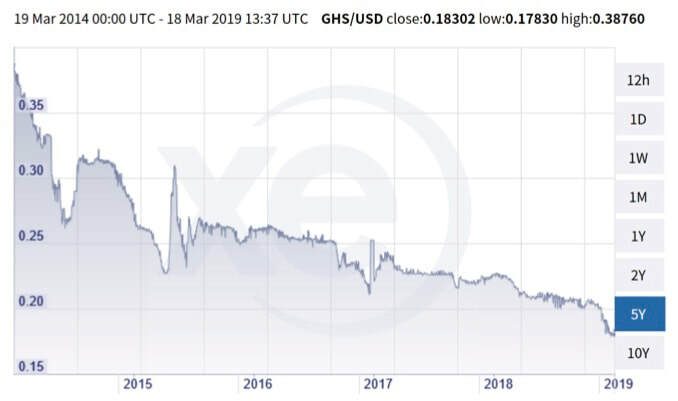 First of all, one possible cause comes from a temporary supply/demand imbalance in the forex market and the cedi depreciates when demand for foreign currencies, especially for dollars, outstrips supply. Victor Yaw Asante, head of commercial, corporate and investment banking at First National Bank Ghana, points out that the drop at the end of January coincided with a shortage of US dollars determined by the demand of Ghanaian importers who had to pay invoices accumulated during the period preceding the Christmas season. While this is a seasonal phenomenon, importers have accelerated their purchases, scared by the depreciating cedi. Prof. Eric Osei Assibey highlights another possible cause for the currency imbalance: the economic decisions of multinational companies that do business in Ghana. According to him, one of the short-run causes of depreciation is to be found in the economic decisions of multinational companies and foreigners. At the beginning of every year these companies exchange their cedi revenues for dollars to send them back to foreign countries and this creates a shortage of dollars. Second of all, many investors may have been scared by the expiration of the IMF program in April 2019, an arrangement for 918 million dollars, which was entered into by the Ghanaian Government in 2015 to help the country out during another currency crisis, at that time largely dependent on the fiscal deficit of the country. Among the solutions proposed to address the depreciation of the cedi, a bridge financing arrangement of $500-$700m, aimed at supplying the market with dollar liquidity, is expected to be provided by a group of banks by the end of the month. Another possibility would be to issue bonds denominated in another currency: the proposal of a eurobond issue to be marketed in the US has been already put forward. A standby agreement with the IMF could also be an option to ward off the fears of international investors. The actions that will be taken in the near future will clarify if the emergency attempts to stabilize the cedi will prove successful.